Mention the name ‘Taj Hotels’, and luxury it means! However, Taj Kuteeram is a welcome break from the perfect world of luxury hotels. It’s imperfection and nature’s abundance transports you to your roots, away from the hustle and bustle of the city life. Located near Hesaraghatta, Bengaluru, Taj Kuteeram is a breath of fresh air for those longing to get away from the urban jungle. After traveling miles, you finally reach a road that takes you through green fields (which only means you are coming closer to Kuteeram). A word of warning – you won’t find well-dressed staff to welcome you with a garland of flowers (in case that’s what you are expecting). There’s a humble security staff to greet and assist upon your arrival. The road ends in a circular parking area flanked with Kuteeram on one side and Nrityagram on the other. The beautiful stone walls and the architecture transport you back into the past. After a short walk on the pretty pathways dotted with greens on both sides, you reach a small pond that is beautiful in its own way. Here lies the restaurant which looks splendid set in the rustic architecture by Da Cunha from Goa. The property houses independent cottages and the size varies for each. A walk through Taj Kuteeram is a must in the evening hours as this provides an ideal backdrop to click photographs in the setting sun. Nighttime is beautiful with only the silence that continues till the morning hours. The gardens are designed to soothe the senses. You may be startled by the harsh honking of the Geese once in a while as they walk around. These pretty birds roam around the lawns freely – either to take a walk or for a dip in the pond. I simply loved the way they defined their day including lots of fresh air, soaking up the sun, bathtime and of course, green grass to satiate their taste buds. Simple, and uncomplicated, isn’t it? 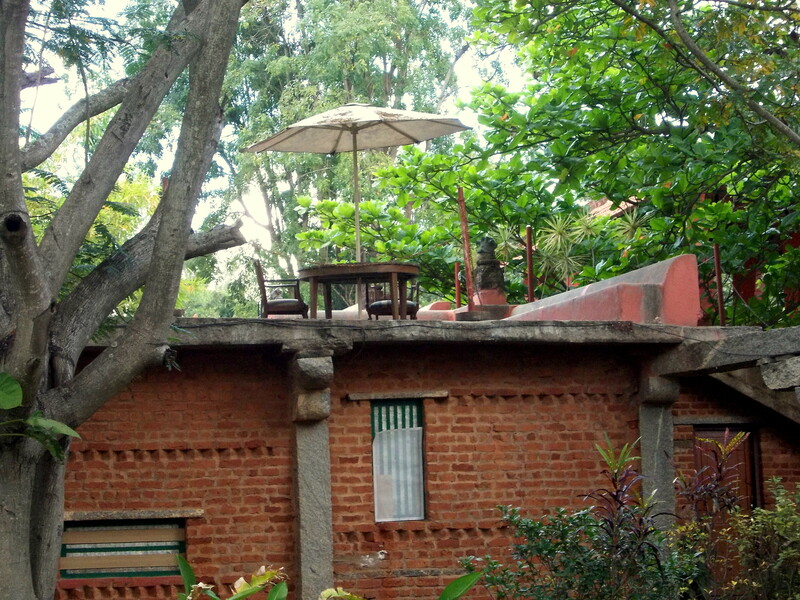 The cottages of Taj Kuteeram are set in stone and have rustic interiors. Indian Warli-style painting dots the window frames and the walls. The backside of the AC cottage opens up to a personal space with an attached swing. The food on offer is quite basic. Kuteeram has a fixed buffet menu but they are willing to whip up dishes upon request. Their cook was definitely not the standard you would expect from Taj hotels, but hey! I can forgive them for the lack of expertise as the environment was marvellous. (What I cannot forgive was a leaky faucet in the bathroom.) Mr. Ramesh was quick to attend to the minor problems though. The staff is helpful and friendly. Plan your trip to Taj Kuteeram with nature in your mind but do leave your worries behind!